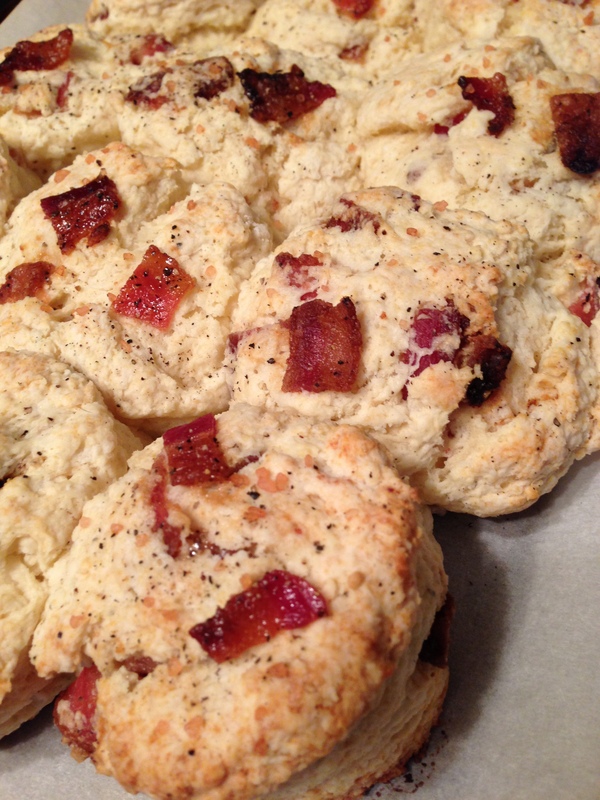 Home » Recipes » Bacon, Brown Sugar Biscuits, Oh My! 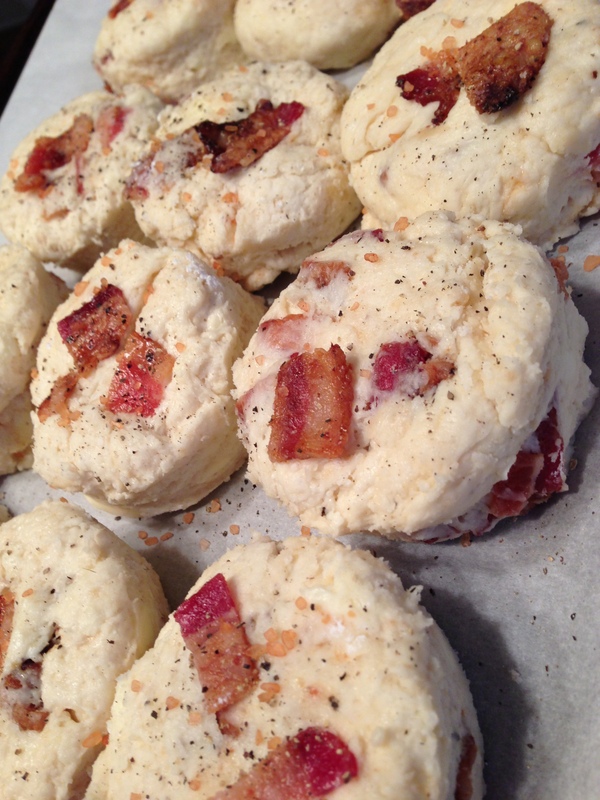 Bacon, Brown Sugar Biscuits, Oh My! If only for tonight, I feel like I have made it as a Biscuit Maker. Tomorrow or the next day or next week I may try another recipe, another biscuit, and be disappointed. 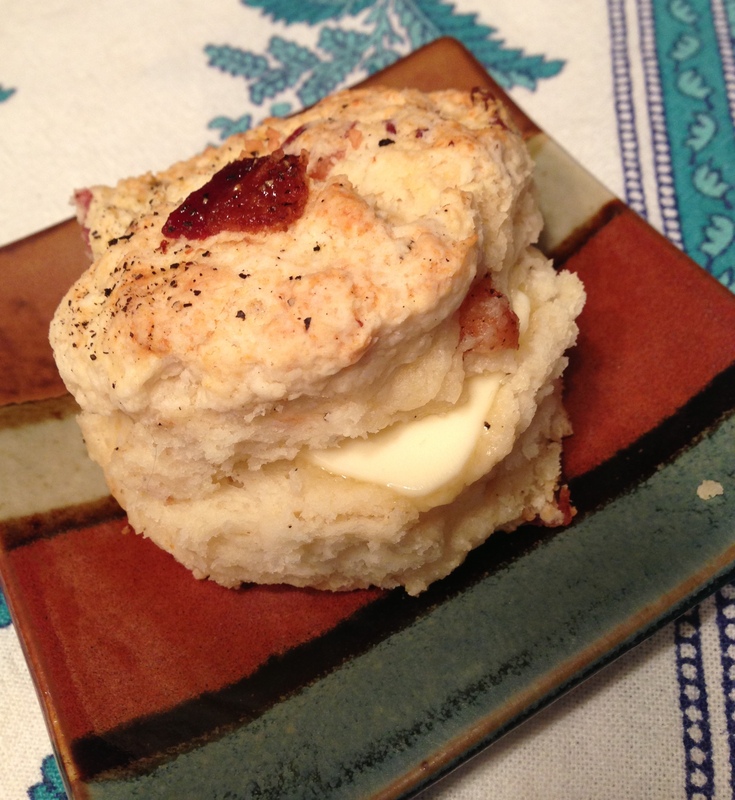 All I know is that the Bacon Brown Sugar Biscuits I baked tonight put me into a whole new category. The recipe comes from a post by Joy the Baker. She has many other great biscuit recipes that I can’t wait to try! Sorry – no orderly arrangement of ingredients here. This is how I bake. Um. 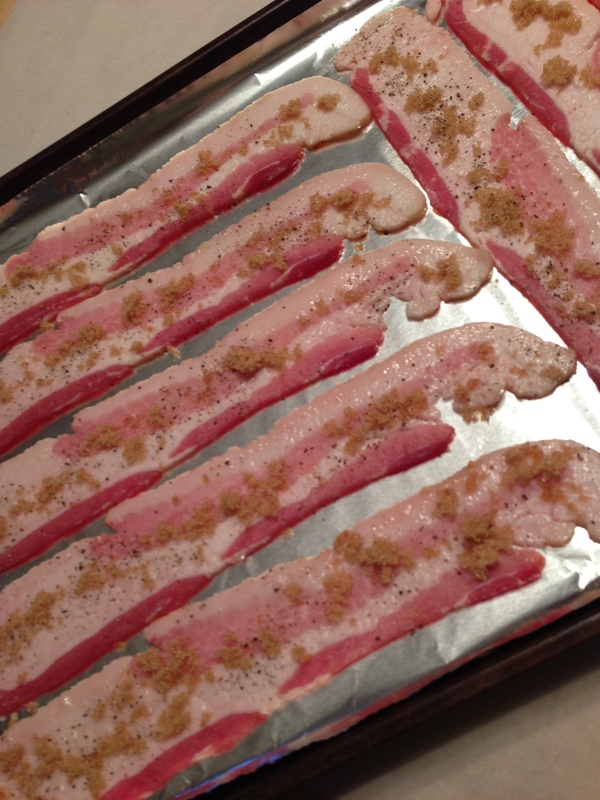 Bacon and brown sugar. I was ready for a biscuit that would knock my socks off. And um, did I mention the bacon? 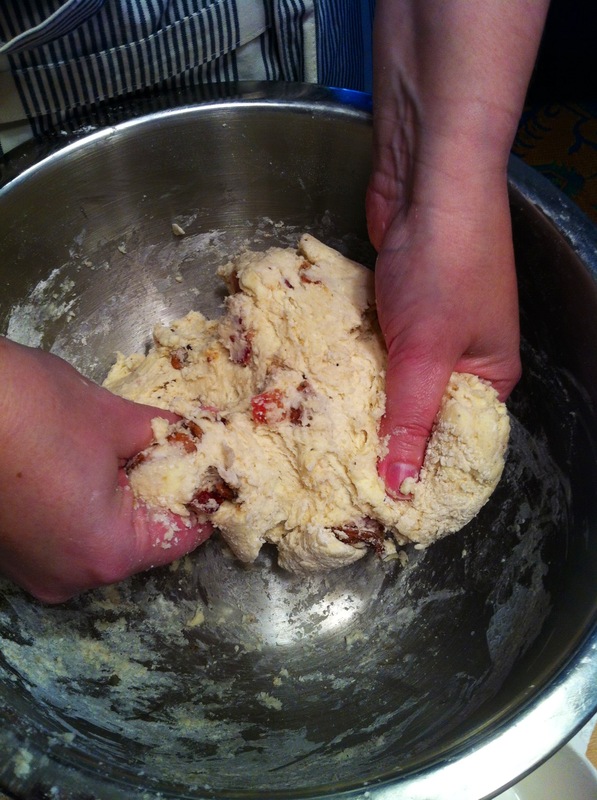 Actually, I had seen several biscuit recipes that called for bacon, but most of them have onion in them as well. That sounds good and I’m sure I’ll try that, but the brown sugar idea is what got me. I love sweet and salty together. One thing I thought interesting is that this recipe calls for an egg. Before I actually started the baking of biscuits and was still just in research mode, I put together a spreadsheet of biscuit recipe ingredients from different sources. Yes, I am that person. I only found one that had an egg. I’m not sure what the egg does. Holds the ingredients together better? Makes them more moist? If you know, please comment and tell me! The bacon all by itself was something special. Baked in the oven, sprinkled with brown sugar and black pepper. Oh my goodness. I may never cook bacon any other way. The only changes I made were cooking the bacon the night before and adding a sprinkle of extra pepper and sea salt on the top prior to baking. The pepper in the recipe is a really nice compliment to the sweet and salty. What would I do differently next time? Probably cut the bacon up into smaller pieces. That’s about it. The sounds we made while eating these were almost embarrassing. They were that good. They may not be the prettiest biscuits I’ve ever made but WOW they were good. The perfect blend of sweet, salty, smokey, and peppery. We reheated them in the microwave – just wrap a damp paper towel around a biscuit and nuke it for about 10 seconds. Let it sit for about 20 seconds, then eat! I also toasted them because I have this thing about toasted biscuits. Wonderful! I think they would probably also be good as a sandwich, like a BLT with the bacon already in the biscuit, but am not sure I can keep enough of them around to find out. They are that good. 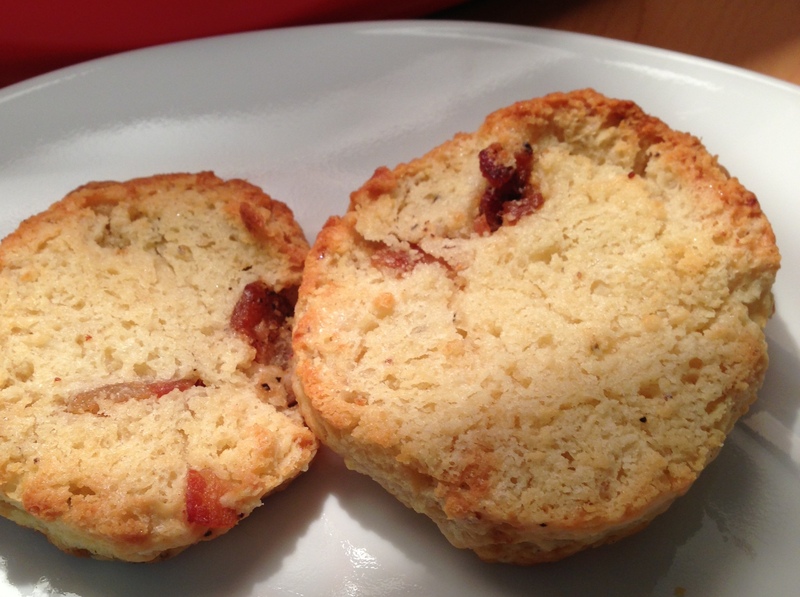 This entry was posted in Recipes and tagged bacon, bake, Baking, Biscuit, biscuits, brown sugar, butter, buttermilk, pepper, recipe, reviews. Bookmark the permalink.